MWAHAHAHAHAHAHAHAHAHAHAHA! I am an evil copyeditor! You give me your manuscript, and I will purposefully make mistakes to vex you. I will put commas in the wrong place! I will leave something lower case, rather than capitalizing it. I will laugh at your semicolons, and I will defy your efforts to place quotation marks outside the restrictive confines of the period. And you? You can do nothing to stop me. Because what I say goes. 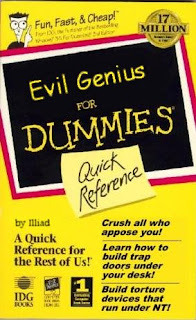 If you argue with me, I will simply pull out my evil style guide and show you how you are wrong. Or my copy of the Evil Chicago Manual of Style, 666th edition! And then, as you stand there, mouth agape, I will laugh in your face in the most grammatically correct way possible. Like this: Ha! Ha! Ha! Ha! Ha! Ha! Ha! Ha! Ha! Ha! Ha! Ha! Ha! Ha! He! He He! He! He! Ho! Ho! Ho! Ho! And when I am done laughing, I will poke you with my red copyediting pencil, so that it looks like you are bleeding, but it's actually red pencil markings, like I quickly proofread your arm and marked it for errors. People will read your book, and since your name is on it, they will think you were too stupid to use proper grammar. They will create a Wiki of your grammatical errors, and then all of them will gather on the internet to make fun of you. Only you and I will know the truth. That I, your evil copyeditor, made those errors on purpose to make you look ignorant. Some evil people have nuclear warheads. Some build lairs in unlikely evil places. Me? Armed only with my pencil and several Post-it notes, I will take you all down....slowly and with many dangling modifiers. @jody! : MWAHAHAHAHAHAHAHAHAHAHA! (I'm still toying with evil declarations. I'm thinking, "You have been punctuated!") But for now, I will only cackle wickedly and taunt you from afar. I like that fact that one of the tags on this post is "Regular copyediting." @WB: I tag things weird sometimes just to see if people will notice.